The MXR Dyna Comp, the wildly popular compression pedal, has found its way into the rigs of guitarists as wide ranging as Joe Perry to Tim Mahoney to Johnny Garcia, as well as into the pedalboards of countless other discerning guitarists, looking to add a touch of sustain to solos. The MXR Dyna Comp also provides an easy way to even out the volume or provide a chunky, clicky clean guitar tones. Operation is simple - two knobs (Output and Sensitivity) allow you to determine output volume and at what volume the MXR Dyna Comp engages. 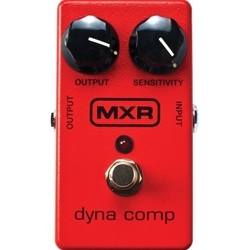 MXR Dyna Comp puts classic compression into a compact pedal!